Correction: KQED made an error in its reporting. Environmental Chemical Corporation was not part of the Florida Attorney General’s investigation. KQED regrets this error and apologizes to ECC for the mistake. ast Oct. 23, as the wildfires that ignited two weeks earlier still smoldered across Northern California, a few hundred survivors gathered at a press conference in downtown Santa Rosa to hear an update on their next major hurdle: getting rid of the ash, toxic debris and waste left behind where their homes used to stand. One after another, federal, state, and local officials reassured the anxious crowd. 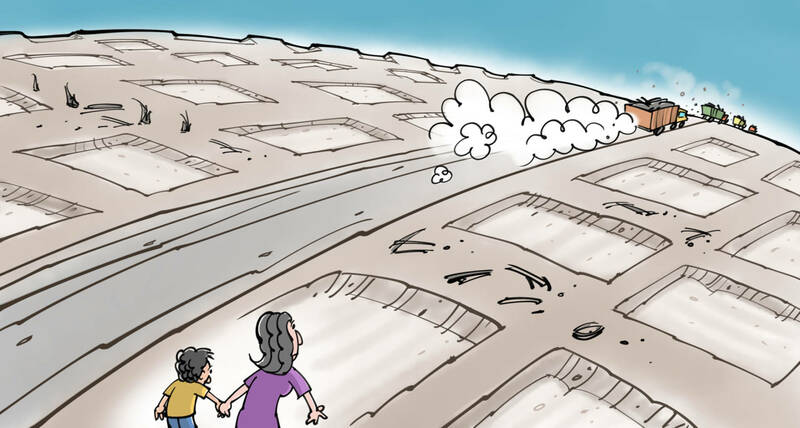 They promised that their devastated homes would be cleared safely, carefully and quickly. Over the next seven and a half months, contractors worked across Sonoma, Mendocino, Napa and Lake counties, where they scraped 2 million tons of soil, concrete and burned-out appliances from 4,563 properties, loaded it all into dump trucks, and hauled it away. In the end, the government-run program was the most expensive disaster cleanup in California history. The project, managed by the Army Corps of Engineers, totaled $1.3 billion, or an average of $280,000 per property. The bulk of that $1.3 billion comes from the Federal Emergency Management Agency (FEMA), but state and local governments are also responsible for about $130 million. It’s an astonishing price tag. 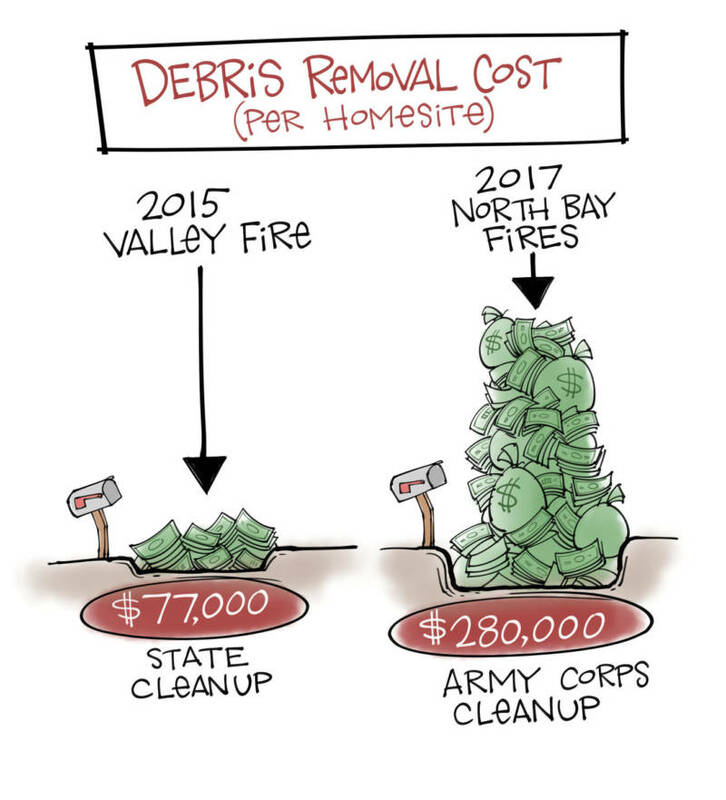 For comparison, the 2015 Valley Fire cleanup in Lake County, which was managed by the state instead of the Army Corps, totaled around $92 million, or $77,000 per parcel. The Army Corps of Engineers said the high cost of the project was necessary to ensure a safe and effective cleanup. But KQED found that these multimillion-dollar federal cleanup contracts actually incentivized unsafe and destructive work. These findings are supported by interviews with more than 20 people, including homeowners, contractors and government officials, and KQED’s review of hundreds of pages of county, state and federal documents obtained through public records requests. KQED also found that Army Corps contractors broke state regulations, and violated health and safety rules. These lapses led to a number of serious injuries and at least one death. At a press conference in May announcing the near-completion of the project, Bill Roche, the federal coordinating officer for FEMA, acknowledged there were serious problems with the North Bay wildfire cleanup. He said it has sparked high-level discussions in the federal government regarding the Army Corps’ lax contracting practices. As the fires burned across Northern California, Gov. Jerry Brown saw that the cleanup would be a massive undertaking. He asked the federal government for help, and the Army Corps of Engineers was tasked with overseeing the job. The Army Corps hired three prime contractors that it often relies on to respond to hurricanes, floods and wildfires -- AshBritt Inc., based in Deerfield Beach, Florida, Environmental Chemical Corp. (ECC), based in Burlingame, California, and Ceres Environmental, based in Sarasota, Florida. 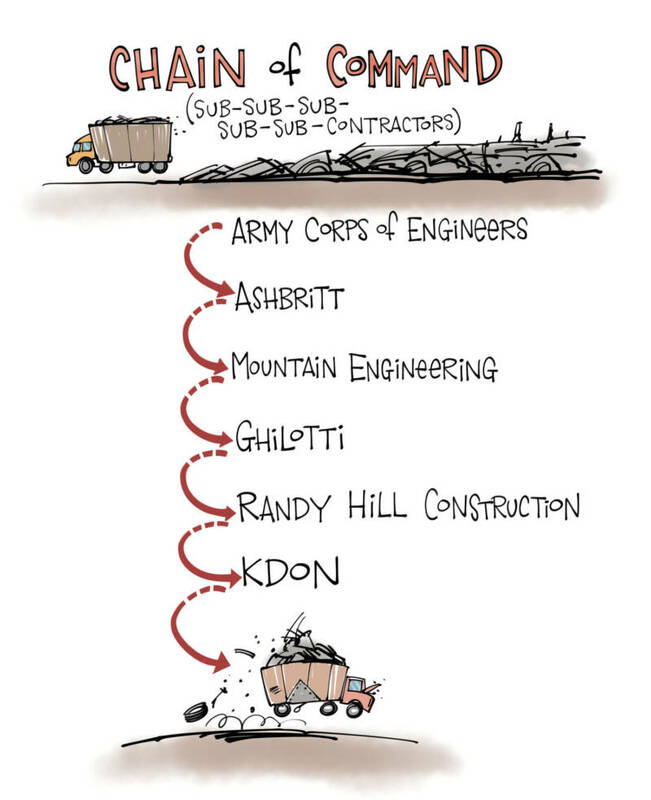 The Army Corps said these “turn-key” disaster contractors are awarded multimillion-dollar contracts after a rigorous bidding process. It’s their job to hire and manage the subcontractors, truck drivers and construction workers necessary to complete the cleanup work. ECC had never done a wildfire cleanup job before. But some of these contractors have also faced allegations of waste and fraud going back more than a decade. The Government Accountability Office found that AshBritt Inc. and Ceres Environmental have overcharged taxpayers going back to the Hurricane Katrina cleanup in 2005. Florida’s attorney general is currently investigating AshBritt for alleged price gouging during the Hurricane Irma cleanup in 2017. Ceres was also issued a subpoena. 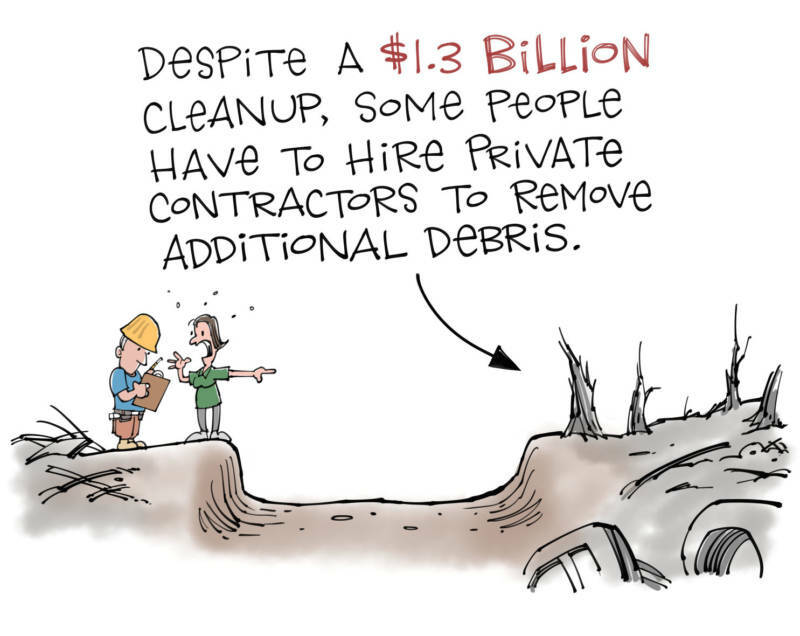 And yet, these prime contractors were awarded $1.3 billion and given responsibility for one of the most complex debris cleanup jobs in the country since 9/11. By Thanksgiving 2017, local labor leaders were worried. They saw evidence that some contractors weren’t hiring locally, and that some were taking shortcuts on worker safety. “All of our guys got laid off,” said Ken Boggs, an organizer with the Operating Engineers Local 3 union. The initial Army Corps contract for $239 million with ECC had already begun to run out, and Florida-based AshBritt was coming online. While 150 skilled union workers sat idle, Boggs said, AshBritt was bringing in people to do debris removal from out of state. “Some of those contractors had no idea what they were doing when they came up here, unfortunately,” Boggs said. 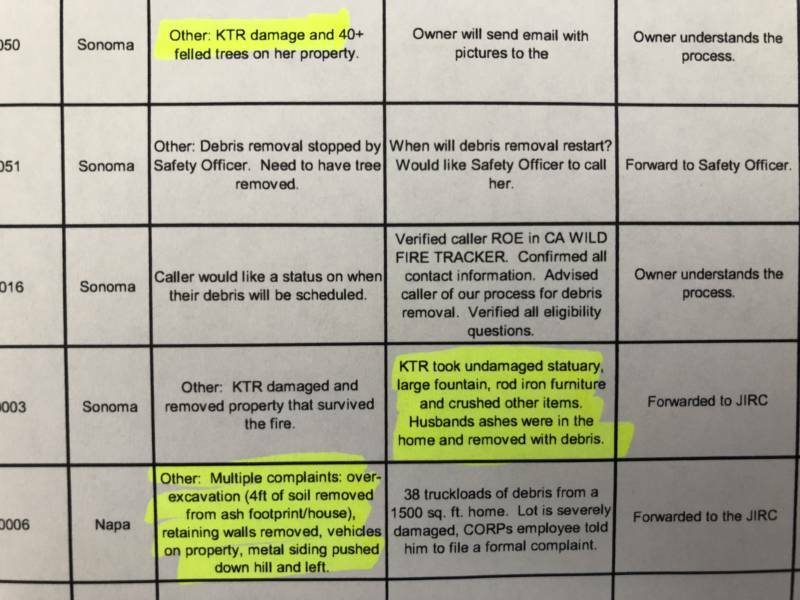 Then on Dec. 8, 2017, a Sonoma County health department worker emailed higher-ups in the county about a troubling incident she witnessed involving a Kentucky-based company called Right Way Tree and Construction, owned by a man named Justin Tate. The county worker wrote that the owners had specifically requested the retaining wall be left intact on the paperwork they had submitted to the Army Corps. Tate confirmed the incident did occur, but said his crew was properly trained. On April 2, 2018, an investigator for the Contractors State License Board issued Tate a fine for contracting without a license. By state law, Tate should not have been hired without a California contractor’s license. The state licensing board fined five Army Corps subcontractors and AshBritt for contracting without a license. State law requires that contractors be licensed to ensure they are insured, know state code requirements and are properly trained for the work. These unlicensed contractors were from Kentucky, South Carolina, Florida, Georgia and California. Justin Tate’s case was referred to the Sonoma County District Attorney's Office. The DA's office is still reviewing the case. Tate said he has a federal contracting license and that he didn’t know California, along with a handful of other states, does not recognize that. He said that a California contractor’s license was not a condition of his contract with AshBritt. Tate said he immediately paid the fine and started taking steps to get the required license. But worker safety issues went beyond licensing violations. In a review of county emails, KQED found multiple reports of people working in the ash footprint of homes without wearing the protective clothing -- Tyvek suits -- that would protect them from inhaling asbestos, ash and other chemicals. “I mean it was a real struggle for us to get to that point,” Boggs said. But safety gear shouldn’t have been an issue. When AshBritt, ECC and Ceres signed those multimillion-dollar contracts, they agreed to ensure that workers were protected from the hazardous material they were hauling away. 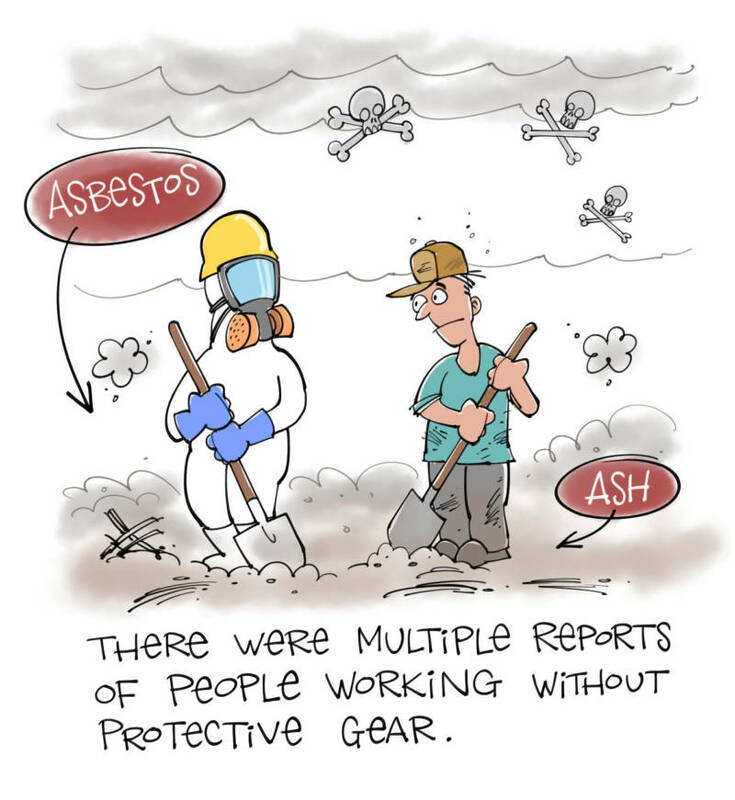 AshBritt CEO Brittany Perkins said that if contractors or workers weren’t abiding by protective gear requirements, the company addressed the problem. She said that the company did work with the unions and prioritized hiring California contractors. Perkins said the company has two core values. As wildfires still burned across Northern California, Gov. Jerry Brown issued a State of Emergency Declaration lifting many of the state’s transportation regulations to make it possible for the cleanup to get done as quickly as possible. Contractors with dump trucks, excavators and heavy equipment started making their way across the state and the country to take part in this mammoth task and get their piece of the federal pie. Dan was one of those contractors, and the lax safety practices he saw during the cleanup disturbed him. He didn’t want to use his full name because he said he’s afraid that if companies label him a whistleblower, he won’t be able to get contracts in the future. Two other sources who spoke to KQED off the record also saw significant management and safety issues. Dan was hired to do truck safety inspections for an Army Corps subcontractor working in Sonoma County. He owns his own trucking company and teaches Occupational Health and Safety Administration compliance. Dan estimates that 30 percent of the trucks he saw pouring into the disaster area weren’t road safe. He saw contractors who bought old salvage trucks, got temporary registrations and put them on the road without meaningful safety checks. Dan said he also saw a truck axle held on by woodworking C-clamps, a 10-wheeler with four flat tires and two tires stripped down to the wire mesh, and trucks with no brake pads at all. Dan said AshBritt and ECC did conduct safety inspections, but that they were done by people who didn’t know what to look for. And then came a death. On Dec. 15, 2017, Ezekiel Sumner was killed when his trailer backed over him, crushing him to death. State investigators found that the truck’s safety system had been tampered with, causing the accident. The OSHA investigator noted that Ezekiel mostly drove farm vehicles for the past 30 years, not commercial dump trucks. OSHA fined RHC in connection with the accident. The company did not respond to KQED’s request for comment. 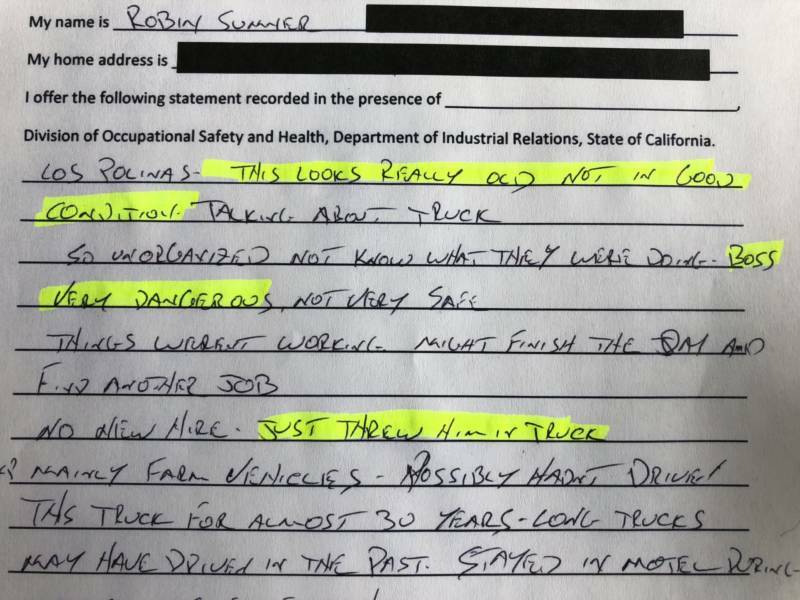 But RHC’s fleet manager, Bruce Fields, told the OSHA investigator that he did train Sumner and that the truck had been inspected multiple times by the CHP. AshBritt was the prime contractor over Sumner, but it was insulated from state regulatory penalties by the chain of subcontractors working under the company, and above Sumner. “AshBritt had strong knowledge and control of people working on our project,” said AshBritt CEO Perkins. She said the layering of contractors between her company and Sumner’s employer is a result of the trucking market in California. The Army Corps gave AshBritt’s chief safety officer an award for excellence in safety, she said. The Army Corps of Engineers is still investigating Sumner’s death. Col. Eric McFadden, the Army Corps commander on the project, said balancing multiple objectives of speed, safety and technical accuracy was one of the biggest challenges. 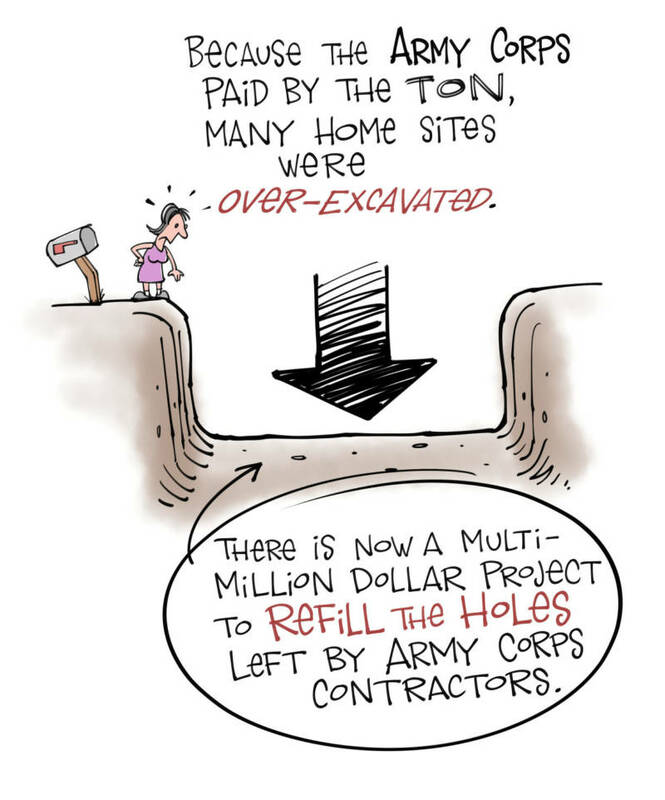 Critics say many of the problems with the project -- high cost, safety lapses and over-excavation -- are linked to the primary incentive structure that the Army Corps put into place: paying by the ton. Contracts reviewed by KQED show that the Army Corps of Engineers paid upward of $350 per ton for wildfire debris. Dan’s truck could haul about 15 tons. That’s more than $5,000 per load -- a powerful financial incentive to haul as much heavy material as possible as quickly as possible. Dan said he saw workers inflate their load weights with wet mud. Sonoma County Supervisor James Gore said he heard similar stories of subcontractors actually being directed to mix metal that should have been recycled into their loads to make them heavier. Safety became an issue because the per-ton payments also incentivized truck drivers to overload their vehicles, Dan said, sometimes by many tons. While the truck itself can handle a bigger load, the brakes can’t. In February, a large dump truck doing debris removal in Santa Rosa caused a fiery 10-car collision when its brakes failed on a steep hill. The Santa Rosa Police Department investigated the accident and found that the driver, Francisco Rodriguez, skipped a required brakes check. The investigation looked into whether the truck was overweight. Sgt. Chad Heiser of the Santa Rosa Traffic Division told KQED that we won’t ever know exactly how much the truck weighed, because part of it was burned in the fire. But he added that even if it was a little over weight, it wasn’t grossly over the registered weight. Seven people were injured, and a woman was paralyzed. ECC was the prime contractor over Flores Trucking, the company that hired Rodriguez. Neither company responded to requests for comment on the accident. The case was referred to the Sonoma County District Attorney's Office for prosecution. Prosecutors are still investigating. Stephen Krickl’s Fountaingrove property sits on a vernal creek and boasts sweeping views of Sonoma’s rolling hills. He and his wife used to talk about how they didn’t deserve the place. “To me this is like the greatest lot,” he said. “It’s beautiful here. It's the sky. I miss the sky." Krickl pointed to where his home used to stand. It’s a 6-foot deep depression that he affectionately called his “pond”. That “pond” was created when contractors removed the foundation, soil and an entire concrete pad for Krickl’s garage, leaving behind a large hole. This is another side effect of the incentive structure of Army Corps contracts. Paying contractors by the ton incentivizes them to haul away as much dirt, rocks and concrete as they can. “It's such a needless waste of our society's resources to pay by the ton,” said Sonoma County contractor Tom Lynch, who was an early and vocal critic of the program. So many sites were over-excavated that the Governor’s Office of Emergency Services recently launched a new program to refill the holes left behind by Army Corps contractors. That’s estimated to cost another $3.5 million. “That’s called job security, honey,” Dan said. Nearly 700 properties in Napa, Mendocino and Sonoma counties applied for the program. Krickl’s is one of 300 properties that qualified to be refilled and re-compacted. Seventy properties are still under review. Paying contractors for time and materials rather than tonnage would have resulted in a safer, cheaper and fairer project, according to Dan and longtime contractor Lynch. But they said any incentive structure requires proper oversight to be effective. The lead contractors said paying by the ton was the best way to get a job of this magnitude done efficiently. And Col. McFadden said paying by the ton was just one of the metrics that the Army Corps looked at. Moira Dossi’s home was perched at the top of a long steep asphalt driveway along Mark West Springs Road. Dossi said she stopped by while debris removal crews were working to haul away the remains of her home. Over the course of a couple of weeks, as her lot and her neighbors’ lots were cleared, the heavy equipment gouged big chunks out of her driveway. Dossi is not alone. KQED reviewed more than 800 pages of call logs provided through a public records request that detail hundreds of complaints of property damage due to Army Corps contractors. Contractor Tom Lynch said four of his clients had their septic systems crushed by Army Corps contractors. Replacing them is going to add tens of thousands of dollars to their rebuild. The Army Corps did not respond to specific questions regarding how property damage complaints have been resolved, but wrote in an email that it is always learning lessons from every disaster. Replacing her driveway isn’t the only cost Moira Dossi will have to bear. She still has to pay a contractor to remove 5 acres of charred trees and more than a mile of fencing. The Army Corps contractors removed only debris from the ash footprint of the home. Removing fencing, trees and landscaping was all outside the scope of the mission. After all the costs of cleanup, Dossi doesn’t know if she’ll have enough money left to rebuild. On June 11, 2018, the Army Corps of Engineers completed its debris removal mission. In response to KQED’s detailed questions about the management, safety and contracting incentives of the wildfire cleanup mission, Army Corps spokeswoman Nancy Allen wrote in an email that the cleanup mission was completed by federal state and local partners safely and efficiently. It was a huge undertaking -- the largest debris removal project in California since the 1906 earthquake -- and the biggest wildfire cleanup in state history. It was also the first time that the Army Corps had undertaken a wildfire debris removal project. The Government Accountability Office said it is currently looking into the North Bay wildfire cleanup, but it hasn’t released an official report yet. As contractors recompete for federal disaster dollars this year, FEMA’s Bill Roche said the lessons of the Northern California wildfire cleanup will not be forgotten. Correction: An earlier version of this article incorrectly stated that the Santa Rosa Police Department's investigation into a 10-car crash in Fountaingrove found the dump-truck was overloaded. Their findings did not conclude that the truck was overweight. The post has been updated to reflect this.